I sin levetid var Asger Hamerik (1843-1923) den mest berømte danske komponist udenfor landets grænser. Både hans storslåede Requiem og Chor-Symphonien (Symfoni nr. 7) fik deres uropførelse mens Hamerik var direktør for musikkonservatoriet ved Peabody Institute i Baltimore, USA. Hameriks musik genlyder af komponistens beundrede læremester, Hector Berlioz, og danner et vigtigt link mellem Niels W. Gade og Carl Nielsen i dansk musikhistorie. I Largo 11:10 12,80 kr. II Andante sostenuto 7:21 9,60 kr. III Grave 16:41 16,00 kr. I Requiem et Kyrie 9:05 9,60 kr. II Dies irae 16:59 16,00 kr. III Offertorium 6:03 9,60 kr. IV Sanctus 4:04 6,40 kr. V Agnus Dei 7:22 9,60 kr. Today, with the Danish musical world well on its way to rediscovering the composer Asger Hamerik, it may seem a little strange that during his lifetime he was the best known Danish composer after Niels W. Gade outside the borders of Denmark. He travelled more and farther than any other Danish composer (including Gade) and was a member of a number of international juries in composition competitions. He was born Asger Hammerich, but changed his surname to the less German-sounding Hamerik when he left Germany and went to France as a result of the outbreak of the Danish-German war in 1864. He had come to the world in Copenhagen on 8th April 1843. His father was a well known professor of theology in his day, and the family had in fact expected Asger to take a theology degree; but his musical talent was so obvious that he was allowed to study composition with both Niels W. Gade and J.P.E. Hartmann, both of whom were related to his mother. In Berlin Hamerik studied with Hans von Bülow. They remained lifelong friends, and Bülow would probably have exerted even more influence on the young Dane, had not political circumstances forced Hamerik to leave Germany. With him he had a letter of recommendation to Hector Berlioz, who accepted him as a composition student. Gradually they too established a more friendly connection, and apart from a few short trips Hamerik remained in Paris until Berlioz died in 1869. Today, 5th June, I have married Margaret Williams, daughter of a landowner in the southern state of Tennessee, descended on her mother's side from the English Duke of Wharton. She is 26 years old, of medium height, slender with bright eyes and light chestnut brown hair, of a mild and gentle nature with harmony of mind and firmness of character." The Requiem therefore lay idle awaiting a suitable occasion, and this now came, with two magnificent concerts on 5th and 6th April. The choir had more than 300 singers, and the work was given more than 60 rehearsals. The contralto soloist, Julie Wynan, had been fetched from New York, and the success of the work was huge - The Baltimore Sun wrote that the music was "of overwhelming beauty". The intervening Offertorio brings the contralto soloist to the fore, and she appears again in the concluding Agnus Dei, now also with the choir. The cyclic form of the text (it returns to the introductory section) is also reflected in the music, in the same way as we see in Mozart (or his ‘completer', Süssmayr) and Berlioz. But by then his time in Baltimore was running out. The board of trustees had decided not to hold regular symphonic concerts any more, and in February Hamerik reacted by handing in his notice to the end of the academic year. As early as 21st April 1898, just seven days before the first performance of the new choral symphony (which at that time bore the title Life, Death and Immortality) he suddenly left the city, followed a week later by his wife, who was pregnant. We do not know if she was present at the first performance in Baltimore's brand new Music Hall (built with the Gewandhaus hall in Leipzig as its direct model), where the Oratorio Society and the Peabody Orchestra were conducted by Pache. In October their son Ebbe (the later composer) came to the world in Copenhagen, and then the family rested on the French Riviera. After this Hamerik was ready for a European tour, during which he presented his own works in Berlin, Vienna, Munich, Dresden, Leipzig, Paris and Milan, before settling down finally in Copenhagen in May 1900. There he composed very little in the course of the long evening of his life - he died at the age of 80 on 19th July 1923 - and lived more or less in retirement as far as Danish musical life was concerned. The Requiem remained Hamerik's own favourite work, and he made sure he included the Offertory movement in the above-mentioned presentation concerts, where it elicited positive comments from all sides: "Belle et émouvante" (beautiful and moving) said Le Figaro. "Eine echte Kirchen-musik" (a true work of sacred music) wrote Wiener Sonntagszeitung, although the concert in Vienna was held in the citadel of secular music, the Golden Hall of the Musikverein, where the reception after the concert glittered with celebrated names like the soprano Nellie Melba. And "classically weighty" was the judgement that could be read in the Danish newspaper Politiken, which had considered the tour important enough to send its reviewer Charles Kjerulf to Berlin. In the spring of 1908 Victor Bendix finally put the Requiem on the programme of the Danish concert society Dansk Koncertforening, but the work proved difficult to rehearse for the amateur choir and at first had to be performed in extracts. On the other hand the success of the complete performance in November the same year was so great that the work could be repeated at a Palæ concert on 13th December, now conducted by Hamerik himself. After this there was only one, not in fact very successful performance in Hamerik's lifetime, in 1921. 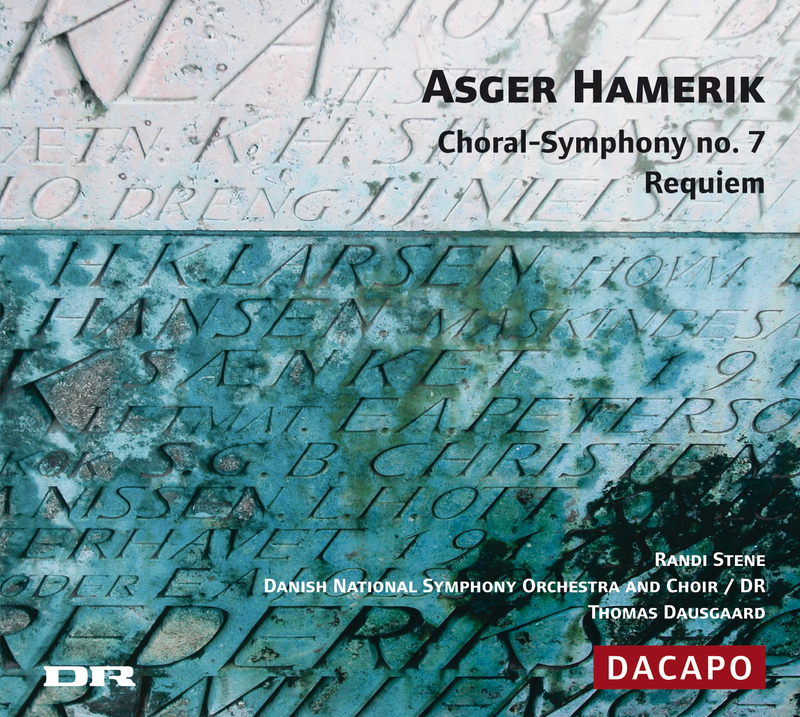 One might have imagined that someone on the Copenhagen concert scene would have got together a Requiem performance to mark Hamerik's 75th birthday in 1918. But instead it was celebrated with the Choral Symphony, which he had in the meantime provided with a Danish text and revised, both textually and musically - twice in fact. It was the shaping of this theme in particular that was a core issue in Hamerik's reworkings. A first revision was premiered under his own baton in Dansk Koncertforening on 1st December 1903, but since then the work had not been played in Denmark - but was played once more in Baltimore in 1907, although it is not quite clear whether this was the definitive version finished in 1906 and published the next year by the German publishing house Johann André. At all events it was the definitive 1906 revision that was used on 31st March 1918 in the birthday concert at the Casino establishment in Copenhagen, conducted by Kristian Ribers. The aging composer and his family sat in the box as guests of honour, and at the end of the concert he thanked the participants. According to Berlingske Tidende's reviewer (who signs himself A.T.), he said among other things that it was in that very hall at Casino that he had himself conducted the Choral Symphony back in 1868! It isn't always the truth that gets printed! Das dänische Musikleben entdeckt den Komponisten Asger Hamerik gerade erst wieder, weshalb es etwas erstaunen mag, dass er zu seinen Lebzeiten nach Niels W. Gade außerhalb von Dänemark der bekannteste dänische Komponist war. Er reiste mehr und weiter als selbst Gade und auf jeden Fall mehr als irgendein anderer dänischer Komponist und saß bei Komponistenwettbewerben in verschiedenen internationalen Jurys. Sein Geburtsname war Hammerich, doch als er 1864 bei Ausbruch des preußisch-dänischen Krieges Deutschland verließ und nach Frankreich ging, änderte er seinen Nachnamen in das weniger deutsch klingende Hamerik ab. Er war am 8. April 1843 in Kopenhagen auf die Welt gekommen. Sein Vater war ein bekannter Theologieprofessor, weshalb sich die Familie auch für Asger ein Theologiestudium vorgestellt hatte. Seine musikalische Begabung war jedoch so offensichtlich, dass er bei Niels W. Gade und J.P.E. Hartmann, die beide mit seiner Mutter verwandt waren, Komposition studieren durfte. In Berlin hatte Hamerik bei Hans von Bülow studiert, mit dem er sein ganzes Leben lang befreundet blieb. Bülow hätte vermutlich noch größeren Einfluss auf den jungen Dänen gehabt, wenn die politischen Umstände diesen nicht gezwungen hätten, Deutschland zu verlassen. Im Reisegepäck hatte er ein Empfehlungsschreiben an Hector Berlioz, der ihn als Kompositionsschüler annahm. Allmählich wurde auch hier aus dem Lehrer-Schüler-Verhältnis eine freundschaftlichere Beziehung. Abgesehen von kürzeren Reisen blieb Hamerik bis zu Berlioz' Tod im Jahr 1869 in Paris. Danach folgten einige Wanderjahre, in denen er u.a. den Einakter La Vendetta schrieb, der 1870 in Mailand uraufgeführt wurde. Im Jahr darauf war Hamerik in Wien, wo ihn der amerikanische Konsul aufsuchte und ihm die Leitung des Konservatoriums und Musikvereins von Baltimore, des so genannten Peabody Institute, anbot. Nachdem er sich nicht zuletzt bei Bülow Rat geholt hatte, nahm Hamerik das Angebot an und ging im August 1871 nach Baltimore, das in den folgenden 27 Jahren sein Zuhause wurde. Hier hatte er ein Orchester von allmählich 80 Musikern zur Verfügung, was bewirkte, dass sich sein Kompositionsschwerpunkt teilweise auf die Orchestermusik verlagerte, zunächst auf eine Reihe Nordische Suiten, die zum Teil auf skandinavischen Liedern und Volksliedern aufbauten, und danach auf Sinfonien. „Heute, am 5. Juni, habe ich Margaret Williams geheiratet, die Tochter eines Landgutsbesitzers im Südstaat Tennessee, die mütterlicherseits von dem englischen Duke of Wharton abstammt. Sie ist 26 Jahre alt, mittelgroß, schlank, hat helle Augen und helles kastanienbraunes Haar, ein sanftes und freundliches, ausgeglichenes Gemüt, aber doch mit ausgeprägtem Charakter." Die Hochzeitsreise ging nach Europa und endete in Kopenhagen, wo die Familie ihr neues Mitglied kennen lernte, bevor das junge Ehepaar wieder nach Baltimore fuhr, wo das Peabody Institute 1895 den 100. Geburtstag seines Gründers feiern wollte. Musikalisch wollte man dazu Hamerik dessen Opus 34 aufführen lassen, ein Requiem, das er während der Sommer 1886 und 1887 in Chester komponiert hatte. Sein Bruder, der Musikprofessor und -kritiker Angul Hammerich, hatte bis dahin vergeblich versucht, den Königlichen Opernchor von Kopenhagen dazu zu bewegen, das Werk bei seinem jährlichen Osterkonzert in der Frauenkirche, dem Kopenhagener Dom, aufzuführen. Das Requiem ruhte deshalb und wartete auf eine passende Gelegenheit, die sich also jetzt mit zwei großartigen Konzerten am 5. und 6. April bot. Der Chor umfasste über 300 Sänger und hatte mehr als 60 Proben abgehalten. Die Altsolistin Julie Wynan hatte man aus New York geholt. Das Ganze wurde ein Riesenerfolg, beispielsweise schrieb die Baltimore Sun, die Musik sei von „überwältigender Schönheit". Hamerik war zwar kein Katholik, war aber mit dem Kardinal Gibbons in Baltimore befreundet und hat sich nachweislich über den Textinhalt und dessen Bedeutung in Chester auch mit einem katholischen Pater beraten. So wie Berlioz in seinem Requiem ein halbes Jahrhundert vor ihm, kombinierte auch Hamerik die ersten beiden Teile der Todesmesse, das Requiem aeternam und das Kyrie eleison, in einem Satz, in dem das ruhige c-Moll-Gebet um ewigen Frieden den C-Dur-Wünschen nach dem ewigen Licht weicht. Das folgende Dies irae zitiert die ersten Töne der alten gregorianischen Melodie zu dem Text vom Tag des Zorns genau wie Berlioz (in seiner Symphonie fantastique). Im Tuba mirum verkünden dröhnende Blechfanfaren im Andante maestoso, auch hier wieder wie bei Berlioz, den Tag des Jüngsten Gerichts. Anders als sein Lehrmeister stellt Hame-rik jedoch einen neuen Zusammenhang her, indem er diese Fanfaren im Sanctus-Satz zum wiederkehrenden Orchesterelement macht. Im dazwischen liegenden Offertorio tritt die Altsolistin auf, die dann erneut im abschließenden Agnus Dei singt, jetzt auch zusammen mit dem Chor. Die zyklische Form des Textes (der zum einleitenden Teil zurückkehrt), spiegelt sich auch in der Musik wider, so wie das auch bei Mozart (oder seinem Vollender Süssmayr) und Berlioz zu sehen ist. Die Baltimorer Uraufführung des Requiems löste in der Presse Begeisterung aus und Hamerik arbeitete gern mit Joseph Pache, dem Leiter der örtlichen Oratorio Society, zusammen, der wie er selbst Schüler von Bülow gewesen war. Deshalb sagte er auch zu, als er um ein neues Werk für Chor und Orchester gebeten wurde, dessen Text er Ende 1897 in Zusammenarbeit mit seiner jungen Gattin gestaltete, worauf er das Werk im Januar-Februar 1898 komponierte. Da neigte sich seine Baltimorer Zeit allerdings bereits dem Ende zu. Der Vorstand hatte beschlossen, keine regelmäßigen Sinfoniekonzerte mehr abzuhalten, worauf Hamerik im Februar mit einer Kündigung zum Ende des Unterrichtsjahres reagierte. Doch bereits am 21. April 1898, nur sieben Tage vor der Uraufführung der neuen Chorsinfonie (die damals noch den Titel Life, Death and Immortality trug) verließ er die Stadt Hals über Kopf. Seine Frau, die schwanger war, folgte ihm eine Woche später. Man weiß nicht, ob sie bei der Uraufführung in Baltimores neu eröffneter, nach dem Vorbild des Leipziger Gewandhaussaals gebauter Music Hall dabei war, bei der die Oratorio Society und das Peabody-Orchester von Pache dirigiert wurden. Im Oktober wurde in Kopenhagen der Sohn Ebbe (der spätere Komponist) geboren und danach erholte sich die Familie an der französischen Riviera. Hamerik war nun bereit zu einer europäischen Tournee, auf der er in Berlin, Wien, München, Dresden, Leipzig, Paris und Mailand eigene Werke vorstellte, bevor er sich im Mai 1900 endgültig in Kopenhagen nieder-ließ. Hier komponierte er im Verlauf seines langen Lebensabends - er starb im Alter von 80 Jahren am 19. Juli 1923 - nur noch sehr wenig und führte im dänischen Musikleben im Großen und Ganzen ein zurückgezogenes Dasein. Das Requiem blieb Hameriks Lieblingswerk, weshalb er auch dafür sorgte, dass der Offer-torio-satz bei den erwähnten Präsentations-konzerten gespielt wurde, wo er überall positive Kommentare auslöste. „Belle et émouvante" (schön und bewegend) stand in Le Figaro. „Eine echte Kirchenmusik" schrieb die Wiener Sonntagszeitung, obwohl das Konzert dort im goldenen Saal des Musikvereins, in der Hochburg der weltlichen Musik, stattfand, wo sich zum Empfang nach dem Konzert so zelebre Persönlichkeiten wie der Sopran Nellie Melba einfanden. „Klassisch gewichtig" konnte man in der Tageszeitung Politiken lesen, die diese Tournee immerhin so wichtig fand, dass sie ihren Kritiker Charles Kjerulf nach Berlin geschickt hatte. Im Frühjahr 1908 setzte Victor Bendix das Requiem dann endlich auf das Programm des Dänischen Konzertvereins, doch das Werk erwies sich als für einen Laienchor zu schwierig, weshalb man sich zunächst mit Ausschnitten begnügen musste. Dafür war die vollständige Aufführung im November desselben Jahres ein solcher Erfolg, dass sie am 13. Dezember bei einem Palaiskonzert wiederholt wurde, diesmal unter Hameriks Leitung. Danach gab es zu Hameriks Lebzeiten nur noch eine, zudem nicht sonderlich gelungene Aufführung, und zwar im Jahr 1921. Man hätte eigentlich erwarten können, dass irgendjemand im Kopenhagener Konzertleben zu Hameriks 75. Geburtstag im Jahr 8 eine Requiemaufführung auf die Beine gebracht hätte. Doch der Geburtstag wurde stattdessen mit der Chorsinfonie gefeiert, die inzwischen einen dänischen Text erhalten hatte und textlich wie musikalisch auch ein paar Male überarbeitet worden war. Hamerik hatte in seinen ersten sechs Sinfonien die klassische Tradition mit vier Sätzen eingehalten und dem Werk eine Grundtonart mitgegeben, hier komponiert er dagegen in drei Sätzen und beginnt in düsterem d-Moll, um dann in jubelndem C-Dur zu schließen. Er fand es jedoch immer noch natürlich, den Zusammenhang der Musik durch die Beibehaltung von thematischem Material in allen Sätzen zu stärken, hier in erster Linie durch ein hymnenartiges Thema, das bereits in der langsamen Einleitung des ersten Satzes zu hören ist und danach vor allem auch im Finalesatz eine entscheidende Rolle spielt. Nicht zuletzt die Gestaltung dieses Themas bildete einen Kernpunkt der von Hamerik vorgenommenen Umarbeitungen. Eine erste Neufassung wurde unter seiner Leitung am 1. Dezember 1903 im Dänischen Konzertverein uraufgeführt, danach in Dänemark aber nicht mehr gespielt, dagegen jedoch 1907 noch einmal in Baltimore, wobei allerdings nicht ganz klar ist, ob man der Aufführung dort die endgültige, 1906 fertig gestellte und im Jahr darauf in dem deutschen Verlag Johann André erschienene Fassung zugrunde legte. Auf jeden Fall spielte man die endgültige Überarbeitung von 1906 am 31. März 1918 beim Geburtstagskonzert im Kopenhagener Casino. Dirigiert wurde die Aufführung von Kristian Ribers. Der alternde Komponist und seine Familien saßen in der Ehrenloge, Hamerik dankte den Mitwirkenden nach Abschluss des Konzerts persönlich. Laut Kritiker der Tageszeitung Berlingske Tidende (der sich A. T. unterschreibt) sagte er unter anderem, dass er die Chorsinfonie schon 1868 genau hier im Casinosaal dirigiert habe! Nicht alles Gedruckte entspricht immer unbedingt der Wahrheit! Denne cd udgives i samarbejde med Danmarks Radio.